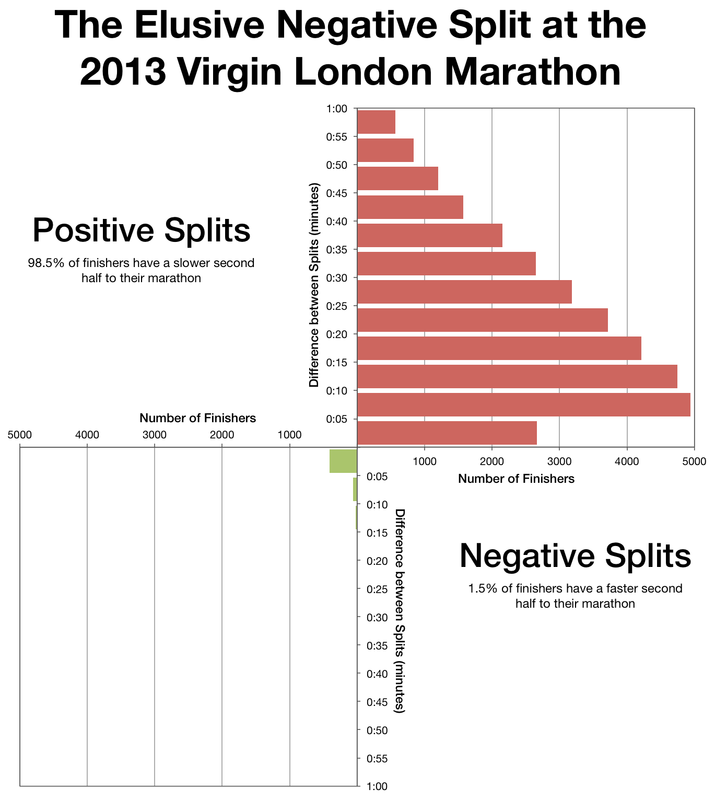 Every runner knows that the correct way to pace a marathon is the negative split, a conservative approach intended to ensure the athlete reaches the latter stages of the race in suitable condition to finish strongly. I can distinctly remember reaching the halfway point of my first marathon, glancing at my watch and resolving to run the next 13.1 miles faster. I didn’t. Despite best intentions I crossed the line with a positive split having gradually slowed over the final 10 miles. I was not alone. 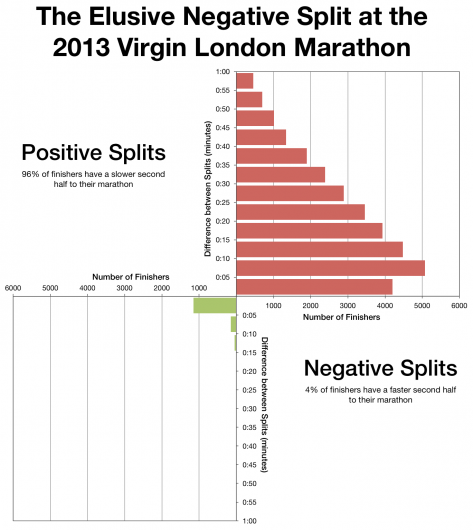 For all the discussion of the negative split, remarkably few actual manage it on race day. 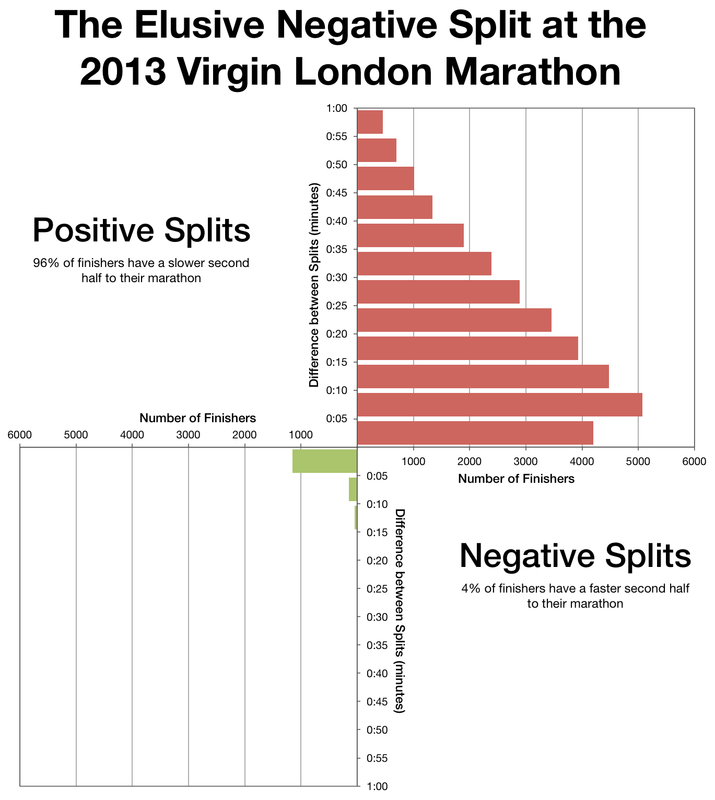 As the results from the 2013 Virgin London Marathon show hardly any athletes negative split, a mere 4% of all finishers ran the second half of their race more quickly than the first. In fact the largest group of finishers are those that ran between 5 and 10 minutes slower in the second half of the marathon, that’s somewhere between 20 and 45 seconds slower per mile. The pattern if we look at average pacing over the course of the marathon is a clear positive split as the graph below demonstrates. Start quickly, at first slow gradually, then, after the halfway point, slow more rapidly, until the sight of the finish and a final surge of energy: this is the positive split. 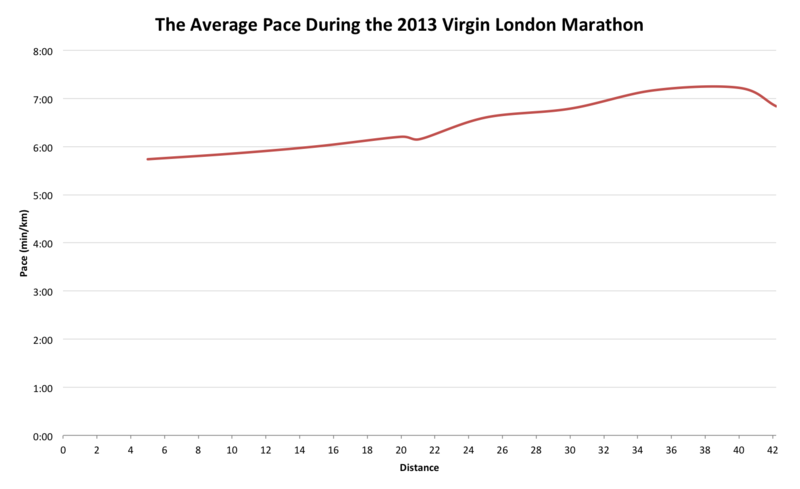 Despite all the advice to hold back in the first half of the race few of us manage it, not even the elites. 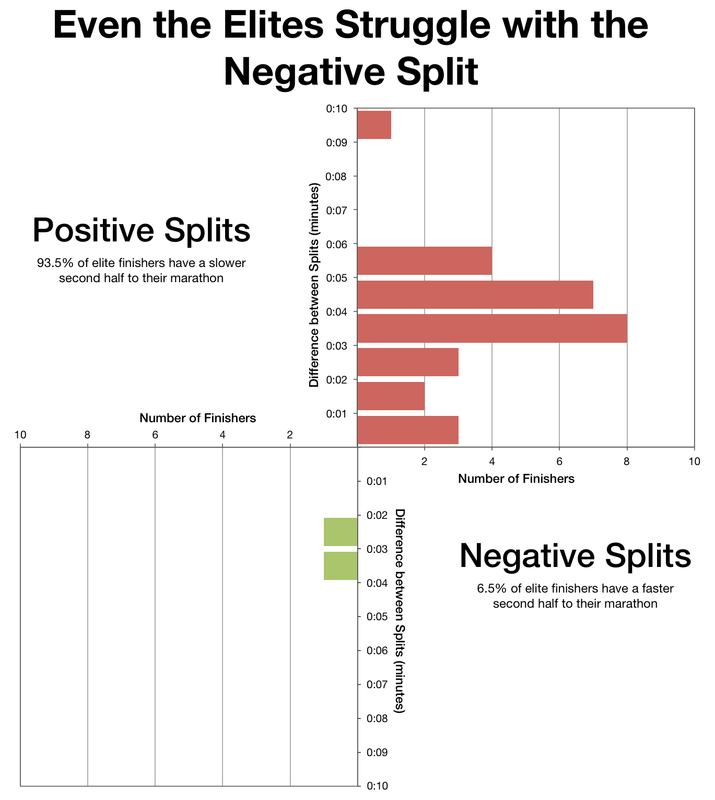 The dynamics of the event may be different but perhaps the fact that 93.5% of the elite field also failed to negative split will be of some consolation to the amateur runners. Treading the line between going too fast early on and not holding back too much is difficult; especially when you’re racing for the win. What should runners do? Certainly not give up on the idea of negative splitting. 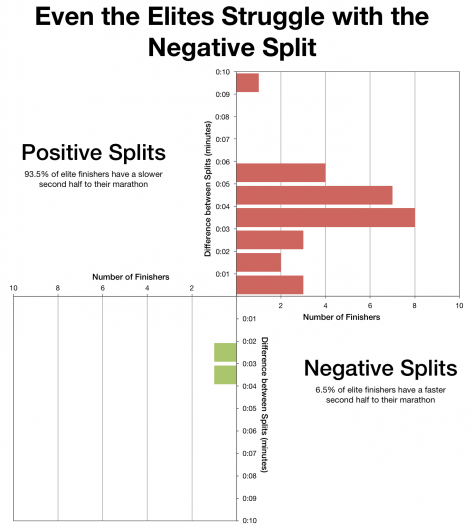 Practice makes perfect, negative splitting some training sessions will help develop the skill. If nothing else mentally adopting a strategy that holds back early in the race will help curb the instinct to go out too fast. 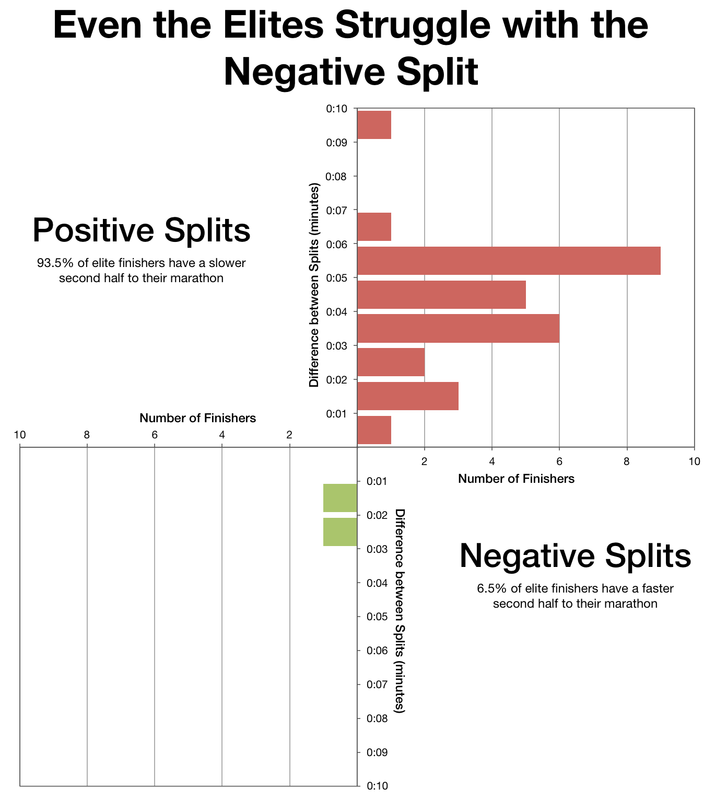 Attempting to work harder in the second half of a race may not deliver the elusive negative split itself, but it might help to prevent a significant positive split.